Welcome to the Cardinal John Henry Newman blog. Thank you for subscribing to it. 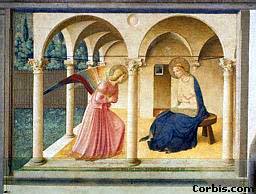 Today we celebrate the solemnity of Annunciation of the Lord – Christ’s Incarnation in the womb of the Virgin Mary. As we celebrate God’s love for us expressed by his wedding the Divine to the human, we are also led to reflect on the marvel of each human embryo enlivened by a divine soul. 1. SYMPATHY may be called an eternal law, for it is signified or rather transcendentally and archetypically fulfilled in the ineffable mutual love of the Divine Trinity. God, though infinitely One, has ever been Three. He ever has rejoiced in His Son and His Spirit, and they in Him—and thus through all eternity He has existed, not solitary, though alone, having in this incomprehensible multiplication of Himself and reiteration of His Person, such infinitely perfect bliss, that nothing He has created can add aught to it. The devil only is barren and lonely, shut up in himself—and his servants also. 2. When, for our sakes, the Son came on earth and took our flesh, yet He would not live without the sympathy of others. For thirty years He lived with Mary and Joseph and thus formed a shadow of the Heavenly Trinity on earth. O the perfection of that sympathy which existed between the three! Not a look of one, but the other two understood, as expressed, better than if expressed in a thousand words—nay more than understood, accepted, echoed, corroborated. It was like three instruments absolutely in tune which all vibrate when one vibrates, and vibrate either one and the same note, or in perfect harmony. 3. The first weakening of that unison was when Joseph died. It was no jar in the sound, for to the last moment of his life, he was one with them, and the sympathy between the three only became more intense, and more sweet, while it was brought into new circumstances and had a wider range in the months of his declining, his sickness, and death. Then it was like an air ranging through a number of notes performed perfectly and exactly in time and tune by all three. But it ended in a lower note than before, and when Joseph went, a weaker one. Not that Joseph, though so saintly, added much in volume of sound to the other two, but sympathy, by its very meaning, implies number, and, on his death, one, out of three harps, was unstrung and silent.